If you aren’t sure what the differences between water pipes, bubblers and bongs, you are not alone. Even many experienced smokers have allowed the details to slip their minds. But, if you need a refresher course or are considering entering the markets for a new smoking implements, the following article will provide an overview of the bubbler along with some of the important selling points for this terrific device. Bubblers are often confused with bongs because the dichotomy between the two devices has a big shady gray area. Both options come in a wide variety of designs, sizes and even an exciting array of special features. Bongs come from a long line of highly developed instruments that can trace their origins alongside ancient herbal smoking tools such as the lavish and elaborate hookahs of the Ottoman Empire. 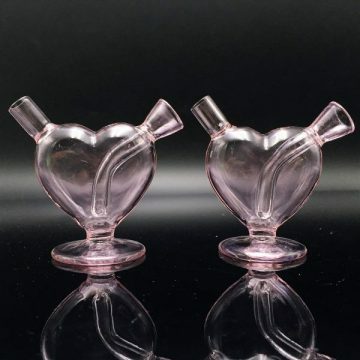 Recently as the marijuana culture has received a more open-minded stance from society at large, there has been an explosion of innovation and ingenuity in the design and creation of a wide array of smoking devices. Where bongs are inclined to be more elaborate, large and even a complex smoking experience for the uninitiated, bubblers are bit smaller and simpler. The bubbler is most often designed to be a handheld device with simple operations and a bong-like experience. A bong can sometimes be built around single important characteristic like an extra-large internal chamber or a specific figure shape or design. This can have some great benefits of course. For one, much larger bongs are less affected by the accumulation of debris and that easily identifiable oily brownish stuff that clogs passages and reduces the functionality of a smoking device. Bubblers on the other hand are designed to be practical and effective. Typically, the bubbler has a smaller internal chamber and will require more regular cleanings to maintain properly. Nevertheless, cleaning a bubbler is easy with some of the modern cleaning solutions available at your favorite cannabis supply outlet. Bubblers are especially popular with those new to the smoking experience as they offer a simplistic and yet full-powered experience to that is highly-desirable. They are handy and practical and can be used with very little focus on the fragility of their design, something that can’t be said about all bongs. A bubbler such as the Martian Bubbler will also weight less than your average bong and require less experience to use effectively. But, there is an important point that can’t be forgotten. A big part of the experience in using a bong, water pipe or bubbler, is the capacity to set up everything just right. This includes adding ice cubes to the water chamber to ensure the delivery of an ice-cold smoke that makes for a much smoother delivery. Due to the smaller dimensions of the bubbler, this is not always possible. For one, the dimension may simply be too small to fit a chunk of ice in the reservoir. The next idea will be to use chopped ice, while this may work for a puff or two, depending on the specific bubbler, the experience will not be the same as when using an ice bong.